There’s a billboard outside the Good Food Store, advertising some sort of banking service with a local flair. Maybe a credit union. You know, the type with the radio ads where they talk about how they (somehow) bank better because the people that work there also live in the community. In general, I find this kind of rhetoric dubious: banks largely operate the same, and the prices for loans and interest and so forth are governed by policies coming out of the Federal Reserve Bank. But this bank I find more convincing. And why? Because their billboard has an honest-to-goodness photograph of the ski tour that I went on Sunday before last! I imagine many Missoula skiers already know what I’m talking about. The billboard clearly shows the north face of the Sheepshead, as well as the northwest face of McDonald Peak, third and first in elevation amongst Missions summits, respectively. I’ve skied the northwest face of McDonald before (twice in fact), but its other equally photogenic aspects were unknown to me. Simultaneously, the enormous southwest face of the Sheepshead has been beckoning for some time. 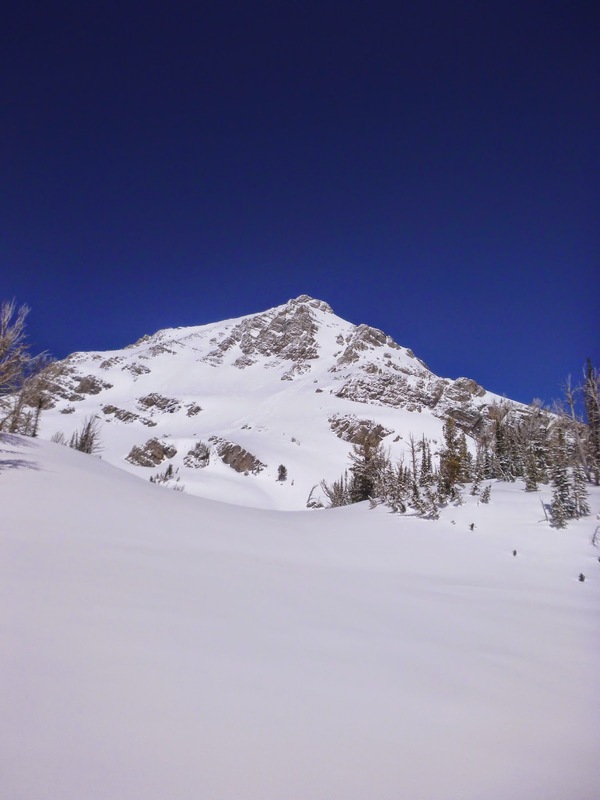 Thus, our goal was straightforward: climb the southwest face of the Sheepshead, and ski it if it was in condition, then climb the south face of McDonald and ski either that or the east face. The opportunities in this zone are endless, and I think it’s good to remain flexible. If the southwest face of the Sheepshead didn’t go, then we could employ our billboard beta and traverse the ridge illustrated in that beautiful display of local advertising integrity. We left Missoula at 3, in order to catch south aspects before they were turned to mush by the strong sun predicted for the day (is it an alpine start if you aren’t sleeping in a tent?). The Ashley Lakes road was quite bad, but the disgruntled Toyota Cyclops was up to the challenge (this is its reason for existence after all). We left the truck at 4:30 and 4300′, booting up through skiffs of fresh snow along the ridge, postholing through drifts, and generally not quite finding an optimal travel method. Nonetheless, we were near 7000′ and traversing the pleasantly moderate lower ridges of the Sheepshead, when dawn broke at six. Our first objective reared up before us ominously. 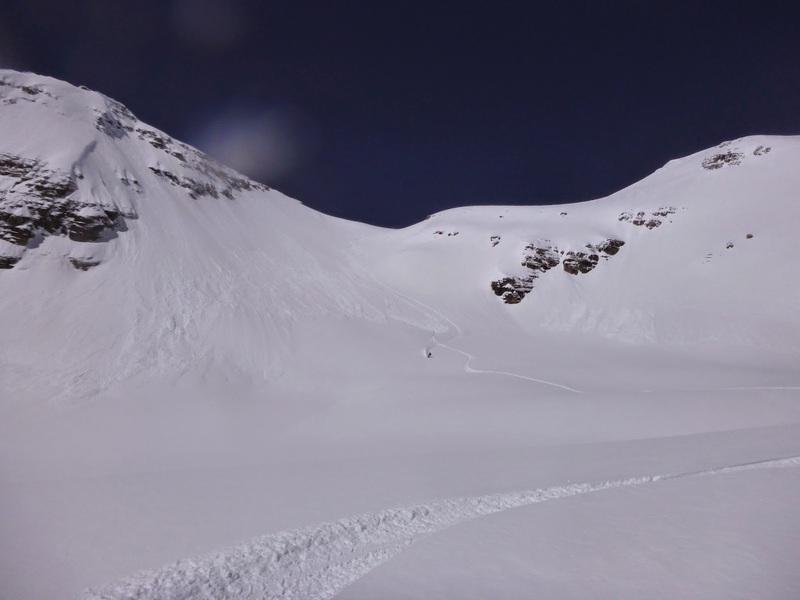 I generally prefer couloirs to faces; this may be purely psychological, but I am intimidated by all that snow, and the lack of an escape onto rock in the event of instability. The southwest side of Sheepshead is both couloir and face: a large moderate and open bowl ending in terminal cliffs encompasses the lower two-thirds of the face, that funnels into a series of steep, rime encrusted, couloirs until a few hundred feet before the summit, then opens again onto another moderate hanging face. This was mostly visible from the approach ridge, and the route was apparent. We needed to cut off the ridge onto the face, traversing perhaps a quarter mile of the lower face to its east end, at which point we would ascend directly through the summit couloir (one of many possible couloirs). After traversing on ski crampons for a ways, we encountered a steep and corniced gully which was more secure on foot, and switched to boot crampons. I was pleased to use, for the first time, the combination of whippet and ice axe. Having the utility of a pole and piolet shaft, as well as two picks, is ideal. 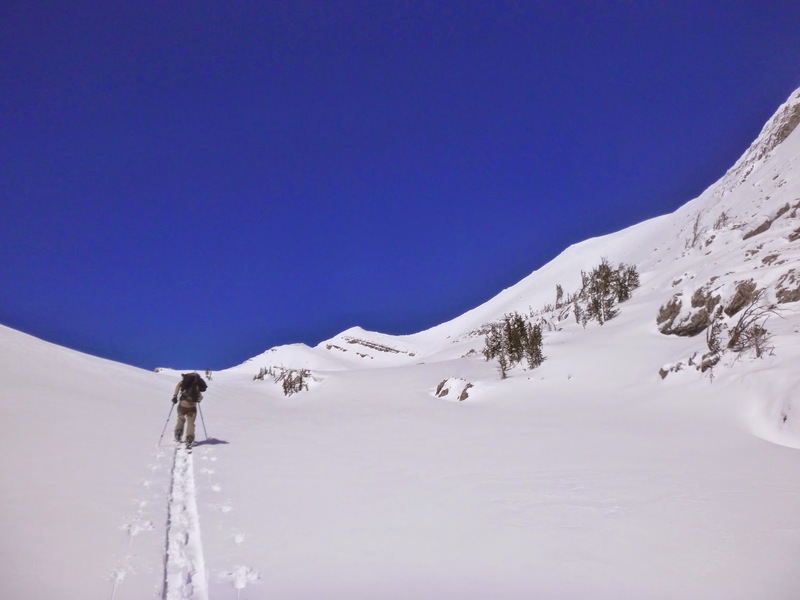 The traverse across the face went easily, and the base layer of snow was unquestionably solid. Overlying this were isolated but deep and spooky wind drifts. Small potatoes, but the consequences of being transported over the terminal cliffs at the bottom of the face were certainly present in my mind. 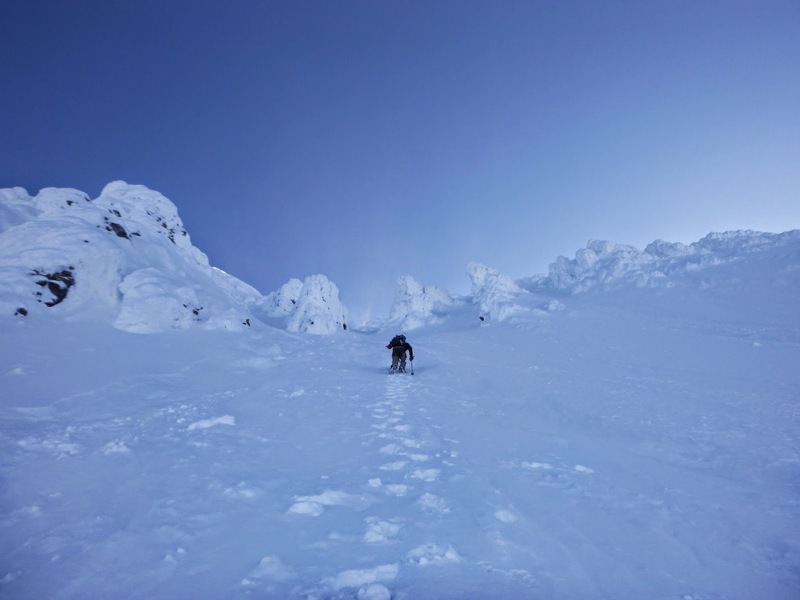 I was relieved when we reached the base of the ascent couloir, and started ascending directly, each crampon step achieving quality purchase in the strongly refrozen corn beneath the fresh snow. Casey Wilcox ascends the upper southwest face of the Sheepshead. We ascended reasonably quickly and topped out on the Sheepshead just after 9AM. We had had the good fortune of spying the exit gully for the face on the traverse; wet slides had scoured it clean, and there was no obvious way through the cliff band. As such, we decided to traverse directly to McDonald along the Sheepshead’s east ridge and face. The wind was quite strong on the ridgetop and the exposure on either side of the knife-edge ridge was extraordinary. Atop the Sheepshead with the northwest face of McDonald behind. Descending the east ridge of the Sheepshead. To the lookers left is the entirety of the Sheepshead’s north face (visible on billboard). To the right is a less impressive though still spooky cliff band. Photo Credit: Casey Wilcox. The east ridge opens onto a lovely, rocky face that drops for a bit over a 1000′ onto the classic northwest face of McDonald. 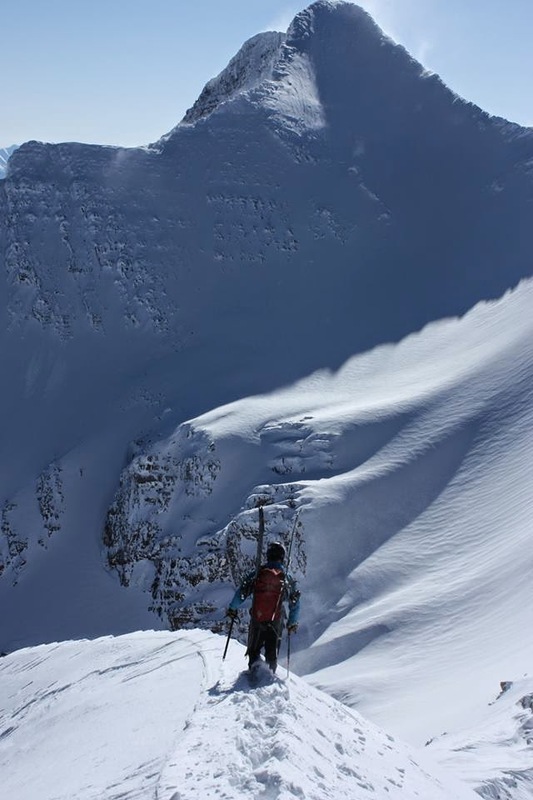 The northwest face is a gem: moderate, remote, alpine. 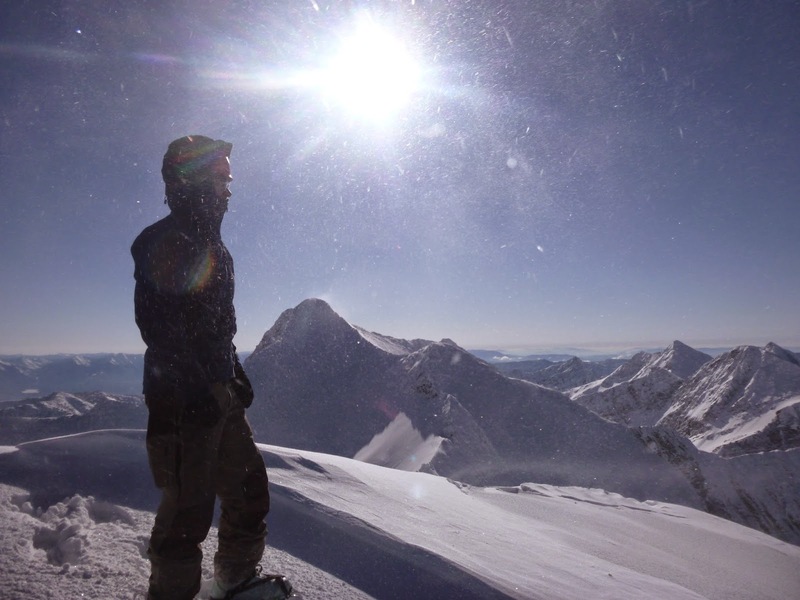 We’d been here twice before, and we made a hard push with ski crampons over fresh windslabs and rime ice to McDonald’s summit at 9820′. 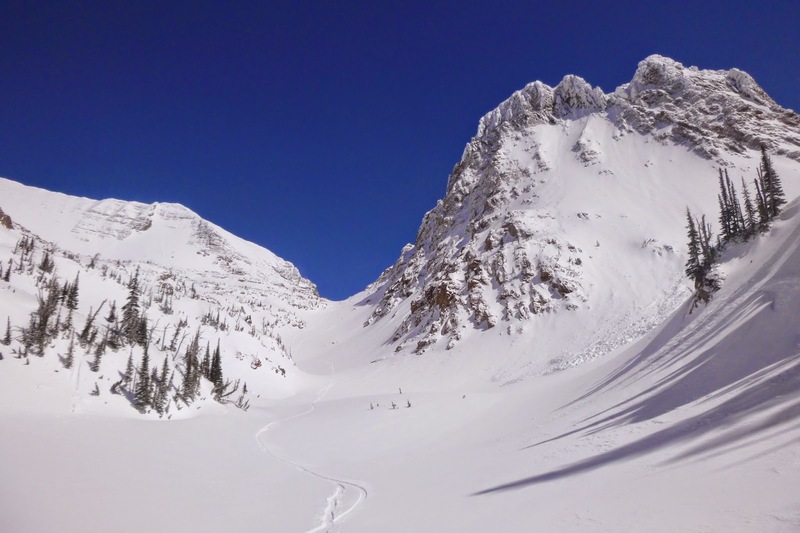 We lingered for a moment, and then decided to try out the east face, which sees very few ski descents (I would guess fewer than one per year). 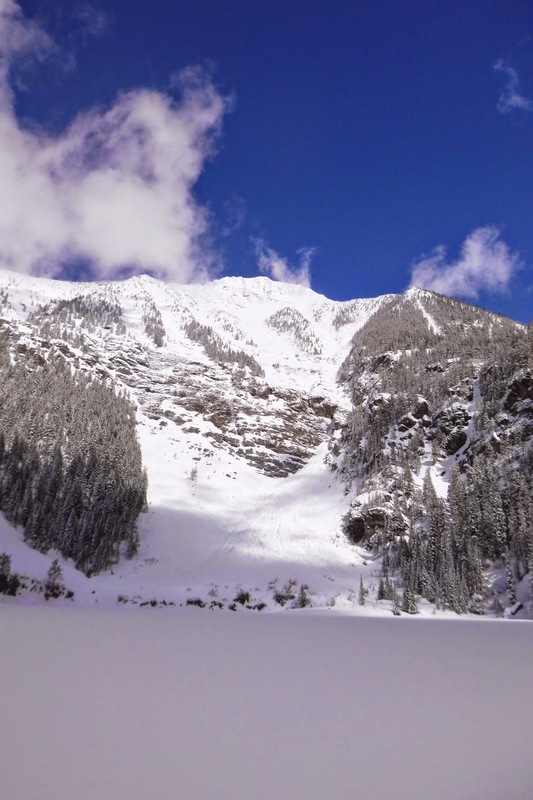 I foolishly attempted to cut across the upper part of the south face on my snowboard, and triggered a localized but deep wind slab at my feet that ran all the way to the valley. Sufficiently chastened, I unbuckled and hiked a few feet back up to the ridgeline and walked until the aspect changed. From here we saw the break in the cornices that Brian Story (presumably) used to access the north face on his epic first descent last spring. Scary stuff. 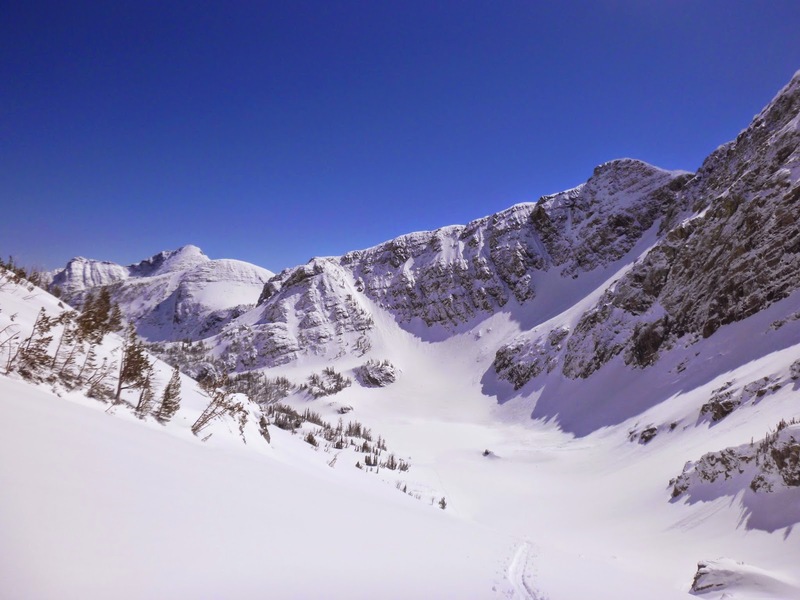 The east face is moderate, never much steeper than 32 or so degrees, and drops between 2000′ and 3000′ to a series of lakes, depending on your route. Much of McDonald had been wind-hammered, and we expecting more or less the same on this weather-exposed face. Upon dropping off the McDonald summit plateau however, I was delighted to find boot top powder on top of bomber corn. Somehow, the vagaries of micro-topography had conspired to protect this line, and whooped for sheer joy (I never whoop) while riding my best line of the year. The upper east face. Much longer than it looks here (1400′). I waited for Casey on a bench halfway down the face (he also whooped uncharacteristically), then we proceeded the remaining 1000′ to an unnamed lake just below Icefloe Lake. The day had warmed up, and we sat around on the lake eating lunch and soaking in the remoteness and late morning sunshine. This area is closed most of the summer; it’s in the grizzly bear conservation zone, so human visitation is prohibited after July 15 (when there is still snow blocking any reasonable approach). If it weren’t, it would still see little traffic because there is no trail here. It’s a long haul from anywhere on skis. Couloirs dropping south from McDonald south. Pt. Charles and Middle Glacier Peak from the Ashley/Post Creek divide. Having accomplished our objectives for the day, we now had to get back to the truck. In between stood a pass, several lakes, numerous cliff bands, and at least a little isothermal wallowing. We pushed hard through the rapidly slushifying snow to the divide between Post Creek and Ashley Creek, which is also the bottom of McDonald’s south face. Divide, with the south face of McDonald. The fresh looking debris is the slide that I had kicked off earlier in the day. From the pass it is a straightforward and fun descent over several miles to just above Ashley Creek. The many unnamed peaks of the area were in full effect, and it was quite enjoyable to cruise down the frozen glacial valley between these monoliths. A cliff band guards upper Ashley Creek from Ashley Lakes. It is not naively obvious how to get around it, but fortunately, Casey had been this way before from below, and knew the way around via a sneak ramp on the south side of the lake. Skinning across the lake, we got an excellent view up at the face that we had ascended early that morning. It is impossible to get a sense of scale from the bottom. Southwest face of the Sheepshead, later in the day. 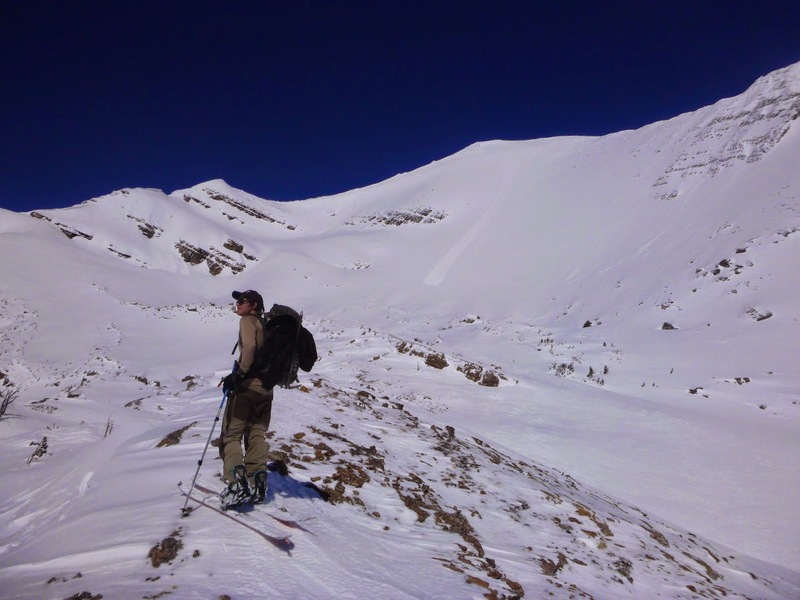 From here, the technicalities ended, and it was simply a slog through isothermal snow, crossing failing snow bridges and split-skiing down willow-saturated hillsides, on the lookout for grizzly bears and trying not to ruin my skins. 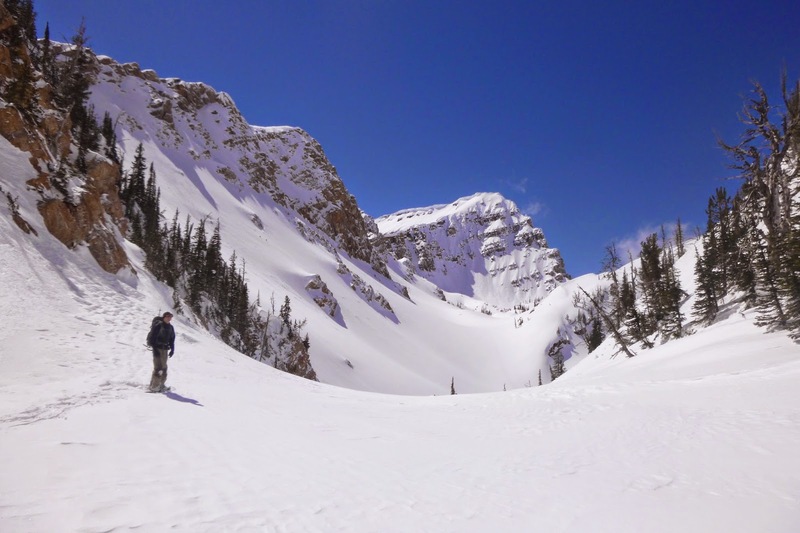 Eventually, the snow gave way, and we booted up and out of the Ashley Lakes basin to regain our approach ridge, and then a simple (though brushy) descent had us back at the truck, dry socks, potato chips, and cider. Overall, around 8500′ of climbing for the day over 14 miles, done in a bit over 11 hours car to car. Certainly one of the best long tours in the Missoula area. Previous PostRooting around, Pt.3: Real Rooting.Next PostHalf Daze of Glory. “Certainly one of the best long tours in the Missoula area”…indeed. Well done!